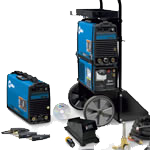 TIG Welding | R.J. Kates Co. 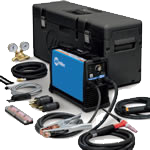 The Invertec® V205-T AC/DC is a compact, TIG power source intended for critical AC or DC TIG welding in a compact 15.0″ H x 8.5″ W x 19.0″ D.
The Miller Dynasty 200 processes: TIG (GTAW), Pulsed TIG (GTAW-P), Stick (SMAW), and Air Carbon Arc (CAC-A) 5/32″ in maximum. 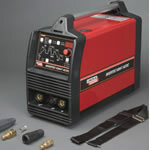 The Miller Maxstar 150 STH handles the processes of TIG (GTAW), Pulsed TIG (GTAW-P), and Stick (SMAW). 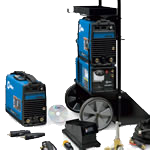 The Invertec® V311-T AC/DC is both technologically advanced and ruggedly constructed and tested for use in Stick and TIG production or fabrication environments. 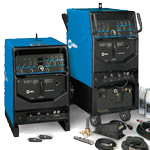 The Miller Dynasty 280 processes: AC/DC TIG (GTAW), Pulsed TIG (GTAW-P), Stick (SMAW), and Air Carbon Arc (CAC-A). 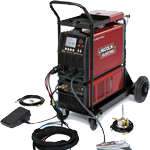 The Miller Maxstar 200 Series processes: TIG (GTAW), Pulsed TIG (GTAW-P), Stick (SMAW), and Air Carbon Arc (CAC-A) 5/32″ in maximum. 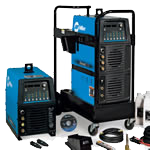 The Miller Dynasty 350-750 processes: TIG (GTAW), Pulsed TIG (GTAW-P), Stick (SMAW), and Air Carbon Arc (CAC-A) 350: 1/4″ max. ; 700: 3/8″ in max. 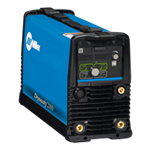 The Miller Syncrowave 250-350 processes: TIG (GTAW), Pulsed TIG (GTAW-P), Stick (SMAW), and Air Carbon Arc (CAC-A) 250: 3/16″ max. ; 350: 1/4″ max.